On the Feast of Our Lady of Sorrows, September 15, 2015, Sister Maria Rosa Nakayama quietly passed on to her new life. We express a special thank you to Sister Stephanie Nakagawa, who took care of many of Sister Maria Rosa’s personal needs during her illness. Sister Maria Rosa had been a Maryknoll Sister for 63 years and was 88 years old. Sister Maria Rosa has donated her body to science. Rosemary Aiko Nakayama was born on February 20, 1927 in Tokyo, Japan to Joseph Hisakichi Soma Nakayama and Maria Ko Nakayama. She had two brothers, Yoshio and Hisao Nakayama and one sister, Hisako Nakayama, who have all predeceased her. She has several nieces and nephews, all living in Japan. Rosemary Aiko attended the Academy of the Sacred Heart and Tamagawa Gakuen in Tokyo and then entered St. Luke’s College of Nursing, Tokyo, Japan, from which she received a Registered Nursing degree. She also did graduate work at that school. She received a scholarship to study at Baltimore Mercy College and the University of Maryland in the USA. It was during that period that two Catholic teachers introduced Rosemary Aiko to Catholic Action groups in the area. They invited her to go with them to Maryknoll and it was that visit that inspired her to enter religious life. Rosemary Aiko entered Maryknoll in 1952, taking the name Maria Rosa, which she retained all her life. She was professed on March 7, 1955 at the Motherhouse and made her final profession of vows on March 7, 1961 in Japan. She was assigned back to Japan in 1955 and did catechetical and pastoral work in the Ise Parish in the Kyoto Diocese from 1956 to 1961 and later in the Sai-in Parish in Kyoto for a short period. Then a big change occurred in her life as she was assigned to assist Sister Ann Mary Farrell prepare for the opening of Maryknoll Girls’ School in Yokkaichi, a port city in Mie Prefecture. There were numerous academic, legal and logistical matters that had to be completed before the school opened in April 1963. Maria Rosa did most of the translation work during those founding days, and later was Sister Margaret Ell’s assistant when she was appointed principal in 1965. Maria Rosa became assistant principal in 1971 and in 1980 was appointed principal. She was named Chairperson of the Board of directors of the School Corporation in 1987 and retained this post until 2003 when Maryknoll Girls’ School was officially transferred to the responsibility of the Escolapias Sisters (Daughters of Mary). During her 40 years of dedicated service to the education of young women, Maria Rosa’s creative spirit could be seen in her numerous efforts to provide a well-rounded curriculum and a variety of extra-curricular activities. Before daily classes, she would give a spiritual or general reflection to all the students over the loud speaker as a way of fostering school spirit. Establishing a cross-cultural exchange program with a Catholic school in Australia provided students with the opportunity personally to experience other customs and values. Over the years, she participated in many civic activities in Yokkaichi, as well as the Japan Catholic School Association’s meetings and programs. She received numerous citations and awards from Mie Prefecture and other national educational associations for her role in providing social education. Maryknoll community life was always very important to Maria Rosa. She participated fully in Japan Regional meetings, gatherings and other events. We could always rely on her delightful sense of humor on simplicity nights during the Regional Assemblies. 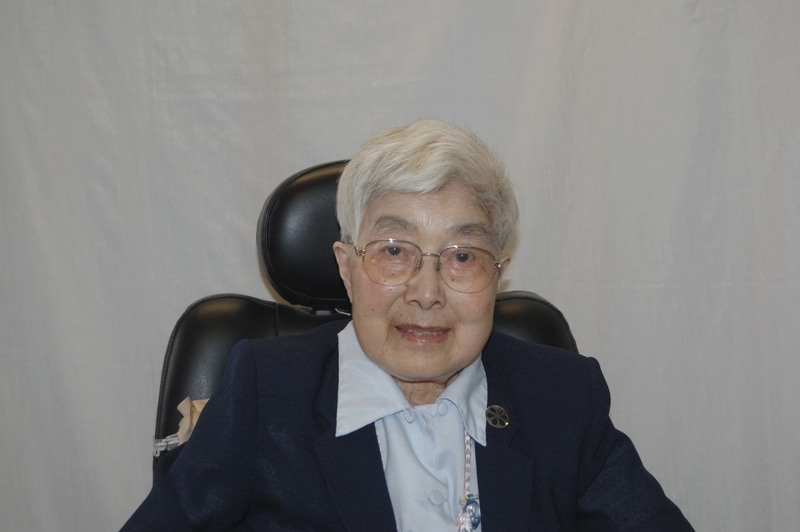 She graciously accepted Regional responsibilities, such as being on various committees and later on becoming the chairperson of the Maryknoll Sisters Religious Corporation in Japan. After Maria Rosa and her long time companion and friend, Agnes Mary McLean, had finished their commitment to the school in 2003, they became involved in visiting homes for the aged in Kyoto to talk with the elderly about their concerns and interests. While living in Kyoto, Sister Maria Rosa often visited her sister, Hisako, and her nieces and nephews with whom she became very close. When the Region was in the process of selling the property in Matsugasaki in Kyoto in 2007, Maria Rosa coordinated a great deal of the legal and financial transactions necessary to facilitate the sale. With the sale of the property, most of the Sisters still living in Kyoto returned to the Center. Maria Rosa became a member of the Eden Community in 2008 and took Japan for her prayer ministry. Her health gradually diminished and in recent months, she was mostly confined to her room. However, her gentle smile and welcoming eyes always greeted those who came to visit. We extend our sincere sympathy to Maria Rosa’s family in Japan and the alumnae of Maryknoll Girls’ School. We welcome our Maryknoll brother, Father Kevin Hanlon, MM who will preside at this Memorial Liturgy of Christian Remembrance for Sister Maria Rosa.